Wolves have been unrecognisable as of late, with their form having taken a major dip since the opening few weeks of the 2018/19 Premier League season. Prior to the start of December they had gone six games without winning, picking up only one point in the process. December wasn’t looking like it would be a positive month either, with their first game of the month being at home to Chelsea, who have been flying high in the league. The Blues’ only other loss in the league this season was at the hands of Tottenham Hotspur, who were also doing well in the league. Wolves were truly up against it and things looked to be going to plan for Chelsea when Ruben Loftus-Cheek scored to put Chelsea 1-0 up within 20 minutes. The Blues were in control as the half time whistle blew. It was four minutes early in the second half in which Wolves made themselves known to their Chelsea counterparts. In the 59th minute, Raul Jiminez levelled the scores, silencing the travelling support. Then just four minutes later, Diego Jota got Molineux Stadium rocking with a goal that put Wolves 2-1 up and in the driving seat for the remainder of the match. The midlands club held on for a famous victory over the 2016/17 Premier League champions and Wolves were back to winning ways. Their six game winless run was over and there was hope that the club could push on from this victory. Then came a trip away to St James Park in order to take on an inconsistent Newcastle United side. The match provided an opportunity for either side to claim an important win which could boost morale ahead of some important fixtures over the Christmas period. It was Wolves who took the lead in this game, with Diego Jota adding to his goal against Chelsea by opening the scoring against the Magpies. Their lead lasted just six minutes as Ayoze Perez equalised to give Newcastle hope of securing an all-important point. The home support’s hopes were dashed in the 94th minute as Matt Doherty scored a dramatic winner to give Wolves all three points and give them their first back-to-back victory since early October. With Wolves having ambitions of reaching the Champions League, these two wins show that the team are able to get themselves out of a rut without needing to change the manager. 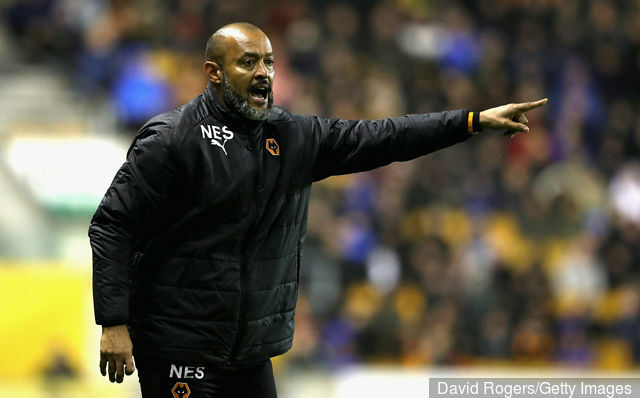 Nuno Espirito Santo could well be the man to take the club into Europe and may even help them to become the UEFA Champions League winner if provided with suitable backing from the board. For the time being though, Nuno Espirito Santo will need to keep his squad focussed on the upcoming fixtures, which feature difficult matches against Liverpool and Tottenham. They are also faced with games against Bournemouth and Fulham in December, which certainly provide the club with an opportunity to cement their place in the top half of the table.